1 Boston Traveler (Boston, Massachusetts), 07 MAY 1952, p. 28, Obituary for Dr. Harry G. Thomas, GenealogyBank.com. 2 Charleston News and Courier (Charleston, South Carolina), 29 DEC 1946, Obituary for mother Harriet M Thomas, GenealogyBank.com. 3 Evening Star (Washington, D.C.), 08 JUN 1952, p. 34, Burial notice for father Dr. Harry G. Thomas, GenealogyBank.com. 5 New England Historical and Genealogical Register, (New England Historic and Genealogical Society), 1982, Vol. 136, p. 330. 6 U.S., Sons of the American Revolution Membership Applications, 1889-1970, SAR #53328, Application for Lowell Thomas, Ancestry.com (Online Database). 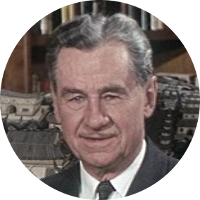 7 Wikipedia, "Lowell Thomas", (accessed 04/03/2016).